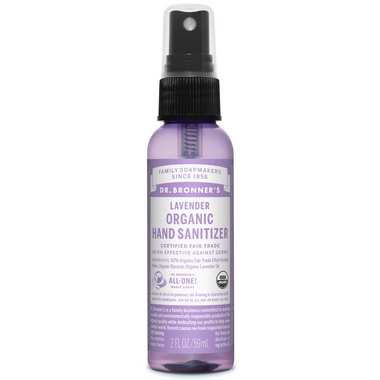 Dr. Bronner's Organic Hand Sanitizer Lavender quickly kills bacteria when no soap and water are available. Love using this for my toddler and the scent is lovely! This is a great hand sanitizer. It smells nice and doesn't irritate my sensitive skin. I love this product! Itâ€™s in my diaper bag so when we are in a pinch and donâ€™t have a sink to wash this does the trick! Perfect for travelling as well! I love to have this product at my diaper change station. It's easy to use and smells lovely! This is my favourite hand sanitizer. The smell is a real fresh lavender scent (as it's using high quality essential oils not artificial fragrances). I bring this with my when I'm travelling. I love this spray! The scent is lovely! I put one in my car so I can spray my hands after being in the mall and makes my car smell good. I also put on in my 12 y/o's lunch bag. I love how handy these are. I have one in my diaper bag and one in my car. Smells great, dries quick and easy to use! I keep this in my purse, its the perfect size and the lavender smell is perfect!! Love this product! I keep it in my car. If you love the smell of lavender and wanna keep your hands fresh, give this a go. Lost 1 star because of the price. Great smell and handy size for carrying in purse or bag. Doesn't dry out the skin like some other hand sanitizers. It's pricey, but worth it. It smells lovely and fresh. It isn't overly drying like most sanitizers are. I have a child with complex medical issues. This is the one I buy for our travel kit. I'm happy this exists so that I can use hand sanitizer when the situation calls for it, without using all those toxic ingredients in other brands. I bought this for travelling and I love the smell and the non-toxic ingredients! The smell is amazing and it doesn't make your hands dry or sticky. This product is hard to find where I live, so I'm glad that Well.ca carries it! love the spray bottle, keeps the hands clean while smelling of lavender. highly recommend! Great products! The smell doesnâ€™t last so long and my hands donâ€™t get sticky or dry. This product smells really refreshing. The sanitizer also leaves your hand smooth and is not sticky at all! I love that the ingredient list is only three items long and I know what they all are! The smell is a little strong, but dissipates quickly. This is a true must have! Smells great, and is essential for daily commutes and anytime you're at an airport! There's no telltale "sanitizer" smell, just lovely lavender! I keep this in my pocket at work (at a public library) for periodic use after shelving or touching door handles. Does have a strong scent, but is pleasant. The main thing is it doesn't dry my hands or leave a sticky residue. Very convenient, but cap is not leak-proof. If you want to hear someone say "what smells so nice" after every time you sanitize your hands, this is the one. Works great without drying out your hands and smells amazing. Very convenient to have on the go with little kids and they love to use it. However the scent is really strong. Only get this if you really like lavender! Love it! My hands are cleaned without the harsh feeling left by gel hand sanitizers. This has a nice smell. The best thing about this is it is a spray so you don't accidently pour too much. I swear by this stuff and make sure I always have one in my purse! My daughter keeps this in her school back pack and uses as needed... nice and easy way to keep germs at bay! Smells nice and much quicker than rubbing gels into your hands. We use it on our whole family from big guys to little girls. This spray is great for my daughter. I toss it in her bag for school and she able to use it without making a complete mess. I love the smell and she loves to do it all herself. Of course we also love that it is organic. I absolutely love this spray! I wish I knew about it before! It's so much more convenient than using gel sanitizers that leave your hands sticky. I carry it with me all the time and feel safe using it on my toddler's hands. It dries quickly and smells pretty and doesn't dry out your hands. I'd definitely recommend it to anyone especially parents! This is great, it smells quite strong at first but it calms down within a minute. It feels clean and doubles up as a product that helps calm you with the lavender. It's as effective as the other chemical hand sanitizers as it has the same % of alcohol. Would buy this again. Absolutely love this stuff. I keep one in the car for after gassing up and one in my travel bag. I feel much better about using it than using the stuff you find in hospitals and such. Yes I could make my own but this is super convenient, smells great and doesn't dry my hands out. I've repurchased many times and would recommend it to anyone. I bought this because I hate the smell of hand sanitizers placed in hospitals and had an up coming surgery. My family was happy to use this instead and other people in the waiting room tried it as well. I will be buying this product again. Smells great! I hate the Alcohol smell in other hand sanitizers. Leaves my hands feeling smooth. I love the smell of lavender and this hand sanitizer did not let me down, it is a little strong the scent but it's so lovely!! And it makes my hand feel clean and moisturized just seconds after I apply it. Love using this stuff! It isn't filled full of all the other harsh stuff that most hand sanitizers are. Love it! Purchased to keep in my diaper bag, now I use the hand sanitizer on a regular basis. It does not like those strong chemical smelling sanizitor that will leave this sticky feeling and makes my hands dry! Love the fresh scent for a little aroma therapy on the go. Super impressed with this product. Works just as well, if not better than regular hand sanitizer. No film/sticky feeling after application, smells great, doesn't dry our or irritate my skin. Highly recommend. Perfect for on the go, I keep this in my purse. This is great on the go. Spray your hands, the shopping cart wherever and smells nice. Perfect diaper bag size! And love the scent... I may have used it a time or two after a stressful trip to the store calms mama and baby down. The smell is much too strong. Otherwise, it is a great product. I have purchase another brand that has a different and more subtle scent.